THE BAD NEWS IS THAT GLOBAL WARMING IS REAL! THE WORST POSSIBLE NEWS IS THAT SCIENTISTS ARE CREATING WARMING, STORMS, AND NATURAL DISASTERS!! We have been able to verify that scientists have been able to control Weather to the point of being able to use it as a military weapon, since the early 1970’s! 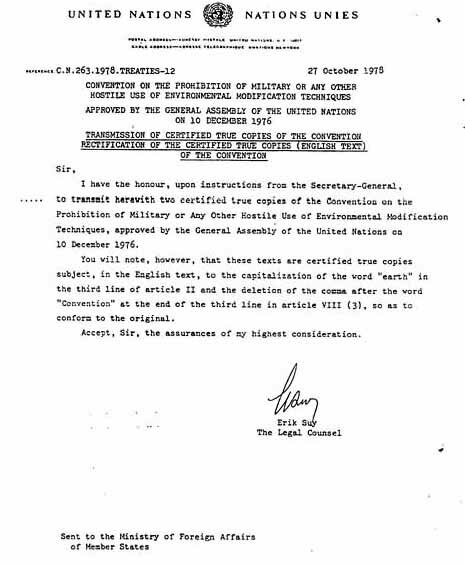 The proof is in the secret U.N. Treaty we discovered! Your life will never be the same. If you were to go back 150 years in records of American laws concerning automobiles, you would discover absolutely nothing. No laws had been passed regulating anything about automobiles in 1848! Why is this true? Why was no one concerned about the safe manufacture, operating, or riding in, automobiles in 1848? The answer is clearly obvious. No one was worried one iota about automobiles in 1848 because no autos had been invented yet. As mindless as this little exercise may seem to you, we went through it to prove a point critical to understanding the information we are about to share with you. Before automobiles came into existence, society had no reason to create laws regulating them in any way, shape, or form. However, once autos came into existence, laws were increasingly needed to keep their operation safe. As autos changed, and became more powerful and complex, laws had to change to keep up with the technology. In the 1970’s, when the numbers of cars on the road in America approached the unbelievable number of 100,000,000, laws were created to reduce the emissions produced by the engines so that our air quality would remain high. Once again, we reiterate the fact that laws about cars were needed only when enough cars were on the road to constitute a hazard if they were not operated correctly. Conversely, we need to point out that the existence of the laws about cars proves that cars exist, and exist in the quantity needed to produce the type of laws we see on our books. If an alien from outer space were to visit this Earth many eons from now, and wanted to find out how we humans moved about our cities, he would have to look no further than the laws in our records to know that we operated a machine we called autos. He would further be able to ascertain much technical data about the auto from the laws in our records. To put this principle in another way, the very existence of laws about autos proves that autos existed, and existed in enough quantity to prove to be a huge problem without the laws that regulated everything. The existence of the recorded law proved the existence of the automobile! Of course, the same could be said for anything in our society, both technical and non-technical. Since this is true, you can imagine our surprise and shock when we discovered that a United Nations Treaty exists which pledges all member states to refrain from using Weather Control as a lethal weapon upon other states! We had long heard of Weather Control devices called HAARP and the GWEN towers, but could find no material beyond concerned New Age scientists. We refused to publish articles on this Weather Control capability based only upon New Age sources, since New Agers strongly tend to be so radical as to tell any lie, or expand the truth to any degree, to get you to believe their point. However, we have since come into a lot of information from sources not New Age, is well documented, and contains the very same information as our New Age sources. Undoubtedly, you can think of many more examples, but you get my point, that something is afoot with our weather. Some force, or a combination of forces, is causing our terribly unusual, unprecedented, weather. Most professional weathermen shake their heads at this unusual phenomenon and simply say they do not know what is causing this type of weather. A lot of politicians, like Vice President Al Gore, are jumping on the bandwagon of Global Warming, warning that more terrible things are going to happen unless we change our lifestyle dramatically. What Gore does not say publicly these days that he said in his book, "Earth In The Balance", is that the lifestyle change he expects to make is the elimination of our entire Industrial Civilization. When Gore attacks the automobile, and wants it eliminated, you know he has his eyes set on our fundamental way of life. [Read Former Radio Transcript, CE1055, "Gore's Book, 'Earth In The Balance' Promotes New World Hysteria To Move World To Global Government"]. Now, let us get back to this United Nations' Treaty. We will examine details of this treaty to prohibit member states from using Weather Weapons on each other. We will also allow you to see the entire document. Let us begin with the cover letter. Notice that the date of this cover letter was 27 October 1978, which means that this treaty was in effect at the time this certified true copy was mailed. The name of the treaty is "CONVENTION ON THE PROHIBITION OF MILITARY OR ANY OTHER HOSTILE USE OF ENVIRONMENTAL MODIFICATION TECHNIQUES APPROVED BY THE GENERAL ASSEMBLY OF THE UNITED NATIONS ON 10 DECEMBER 1976". This title alone tells us conclusively that scientists of at least several nations who have a history of being hostile to one another now possess scientific knowledge that can control damaging weather to the point of being able to use such weather as hostile, destructive weapons. Exactly which countries possess this damaging capability is not clear; however, we know that, in this 20th Century, Western Capitalism has been nose-to-nose with Eastern Russian Communism. Therefore, we can only conclude that both Russia and America possess this technology. What kind of damaging weather might be useful as military weapons? I think the following list might be possible candidates. Earthquakes -- This phenomenon might be the most terrifying, since people cannot live without foundation. Entire city structures are based upon buildings having dependable foundations. Therefore, since the New World Order Plan envisions eliminating cities, we might expect that earthquakes would be a preferred weapon of choice. Severe earthquakes might result in the wholesale evacuation of cities. Hurricanes and/or Typhoons -- Wind has proven to be such a devastating force that, once again, it might force large-scale evacuation of cities if the incidence of hurricanes were to become so regular as to render a city location untenable. Flooding -- Rampaging waters are a huge force that threatens entire regions of the country. Since the goal is to force farmers out of business, or to return the most fertile farmlands back to "Nature" [which New Agers call 'Rewilding'], floods would be a most useful weapon. Read NEWS1028, "1997 -- The Year New World Order Plan Changes, To Produce A 'Thinning of Population' " for full details. Also, read NEWS1101, "Rewilding of America Continues Under Our Noses"]. Flooding can also force farmers to miss an entire planting and growing season, thus reducing the amount of food available to a population. Most people think of a lack of food being caused by drought, when the reality is that flooding at the wrong time of the year can produce an equal loss of food production. Drought -- Lack of water is more devastating to farming than flooding. Since the population growth of the past 60 years would not have been possible had it not been for the growth in food production, we might expect that drought might be a useful tool in persuading people of the need to drastically reduce population growth. In both flooding and drought, we have the potential of really devastating the way of life of a people. New World Order writings exhibit a total lack of respect for the current Industrial Civilization in which we are living. When I was growing up, the Government had enough grain and other foods stored that would last several consecutive years of drought or flooding. However, now we have less than one year's supply stored. If the same people who control the amount of food stored for emergency also control the Weather, we have the potential of a really messy situation. They literally could get rid of our emergency supplies first, and then devastate the crop for the next year through Weather Weapons. Remember that the overall goal of the New World Order Plan is to reduce the world's population by two-thirds, and to set aside over 50% of America and other nations that would not off limits to humans for using or residing. These same people, i.e., Gore, Clinton, Bush, Gingrich, now have control over the amount of emergency stocks of food and of Weather Control capabilities! Tsunami Waves -- If someone would want to force people away from living on the coastline of any nation, consistent tsunami waves would be the ideal tool. This huge wave is totally devastating and terribly frightening. Volcanoes -- Erupting volcanoes can also dramatically change the landscape of the region in which it is located. Nearby cities can, and have been, eliminated. Tornadoes -- We have experienced such an increase in devastating tornado activity, one has to really wonder why. Severe Heat over a long period of time -- Of course, this capability produces the Drought of which we speak, above, and probably should have been mentioned in conjunction with it. However, as our nation is currently in the grip of unprecedented heat this summer, with Texas and other areas of the South in the grip of really serious Heat Wave, we must conclude that our own scientists are controlling this terrible weather. How many consecutive days of 100+ degree weather does it take for fertile and productive farmland to be turned into wasteland? Does anyone know? Are we about to find out? Now, let us return back to this United Nations' treaty prohibiting the hostile, or military, use of Weather Modification capabilities. The first page of this report simply sets forth the framework into which the treaty fits, and is generally not exciting. However, a couple of points jump out at you when you read it carefully. Paragraph 1, beginning with the word "Guided" -- "Guided by the interest of consolidating peace, and wishing to contribute to the cause of halting the arms race, and of bringing about general and complete disarmament under strict and effective international control ..." Were you aware that the entire world, including the United States, was engaged in "general and complete disarmament under strict and effective international control"? Not only is general disarmament of independent nations of the world a New World Order goal, but the turning over of weapons, materiel, and men to the United Nations is a long term goal! The United Nations is the global body given the responsibility of seeing that this planned disarmament takes place. Since the Vietnam War, we have seen the United Nations given more and more of a prominent role in governmental, economic, and military affairs. This 1976 treaty recognizes the preeminent role of the United Nations in disarmament. The United States' Administrations of Bush and Clinton have carefully and quietly gone about to accomplish American compliance to this general disarmament. Our own shrinking of American military has been carried out under the twin disguises of a lack of an enemy now that the USSR has dissolved, and under the guise of budget cutbacks. However, a number of American troops have gone under the command of NATO generals, which is just an adjunct of the United Nations. We are also transferring weaponry and materiel to the United Nations. America has been submitting to the UN for some time now, right under the noses of the people. But, you say, given all the incessant wars of this century, which have been brought about by the warring of individual nations, wouldn't we be better off having one global authority? Certainly, we would be better off if the leadership of this global authority is Godly, kind, generous, and really desiring peace. But, we know this is not the case. Once they have reached a certain point, their goal is to stage the appearance of Antichrist. Listen to the chilling words of Master D.K. once again. "As a means in the hands of the United Nations to enforce the outer forms of peace ... the atom bomb does not belong to the three nations who perfected it ... It belongs to the United Nations for use (or rather hope, simply for threatened use) when aggressive action on the part of any nation rears its ugly head." [Page 548, written in 1946, soon after the UN was established]. How wonderful! The United Nations plans to use the atomic bomb once it becomes the only possessor of it! Then, when you understand that the person who will be controlling the United Nations at this time is Antichrist, you really have a frightening scenario developing, do you not? I am reminded of a certain prophecy, in the Book of Revelation 6. In verses 1-2, we see the appearance of Antichrist, as he is pictured as riding on the world scene on a white horse, which means that he will be claiming to be Jesus Christ, Who really rides on a white horse in chapter 19. Then, in verses 3-4, we see the very next event after the appearance of Antichrist to be all-out war. "And there went out another horse that was red: and power was given to him that sat thereon to take peace from the earth, and that they should kill one another: and there was given unto him a great sword." This word, "great" really means "huge". The rider of this horse wields a "huge" sword. Could this be nuclear weaponry? Doubt it not! The original word in the Greek is "megas", Strong's #G3173, meaning, "(+ fear) exceedingly, great (-est), high, large, loud, mighty, + (be) sore (afraid), strong". When you combine this insight into the passage in Joel 2:30-31, where God describes weapons that produce the very effects of nuclear warfare, especially the tall white columns of smoke! Then, God says that this type of warfare will occur before the Great Day of the Lord begins, i.e., before the Great Tribulation. Now, let us return back to this UN treaty prohibiting the hostile use of Weather Modification Techniques against member states. "Recognizing that scientific and technical advances may open new possibilities with respect to modification of the environment." We cannot ask for a more clear statement that acknowledges the existence of effective Weather Control capability than this one, can we? This statement was made by the United Nations, not by us, nor by any "far-out", "wacky" Patriot group, but by the United Nations! "Recognizing, however, that military or any other hostile use of such [weather modification] techniques could have effects extremely harmful to human welfare". Once again, we have explicit admission that scientists can now control the weather so as to destroy another nation! "Desiring to prohibit effectively military or any other hostile use of environmental modification techniques in order to eliminate the dangers to mankind from such use, and affirming their willingness to work towards the achievement of this objective." This is the last admission that such weather modification capabilities exist before they get into the treaty provisions prohibiting the exercise of such capabilities. We think we have used their own admissions effectively enough to prove that Weather Control capabilities do exist, and must be capable of wreaking enormous damage. Now, let us get into the text of this treaty itself. "Each State Party to this Convention undertakes not to engage in military or any other hostile use of environmental modification techniques having widespread, long-lasting or severe effects as the means of destruction, damage, or injury to any other State Party." Each State Party to this Convention undertakes not to assist, encourage, or induce any State, group of States, or international organization to engage in activities contrary to the provisions of paragraph 1 of this article." Widespread -- can cover large geographical areas. How large of an area did our 1993 floods cover? This flooding covered the entire Mississippi River basin from North Dakota to Louisiana, tens of thousands of square miles. Long-lasting -- Such weather devastation can last for years. Obviously, if a nation cannot grow crops for enough consecutive years, that nation must permanently change or die. In our article, NEWS1106, "Hatred Toward Our Civilization", we demonstrate that our own leaders hate our Industrial civilization, because we consume too much irreplaceable resources, like oil and mineral ore. Our own leaders believe our current civilization must be changed, by destruction if need be. You must get the lie out of your head that our own leaders have our best interests in their heart of hearts. It simply is not so! Severe -- We read that these Weather Control capabilities can produce "severe damage, destruction, and injury". Certainly, Hurricane Andrew produced that kind of destruction. Was Andrew caused by these techniques? Doubt it not! "As used in article I, the term, 'environmental modification techniques' refers to any technique for changing -- through the deliberate manipulation of natural processes -- the dynamics, composition, or structure of the earth, including its biota, lithosphere, hydrosphere, or of outer space." The "deliberate manipulation of natural processes" -- Obviously, scientists can seize hold of natural processes and turn them to their own use. A good example of a natural process is the flow of the Jet Stream. They undoubtedly can manipulate the Jet Stream! Since much of our precipitation, or the lack thereof, is controlled by the Jet Stream, we have every right to be very worried about losing our productive farmland! We should also understand that the very destructive tornadoes, hail, and other destructive weathers are controlled by the Jet Stream. These Weather Modification techniques can also control the "dynamics" of the earth. The Jet Stream is one such dynamic, but so are rainstorms, thunder and lightening, and hail. Can they control these as well? Doubt it not! Scientists can also change the "composition or structure of the earth". This certainly sounds like earthquakes to me! We have been reporting since 1992 that the military can create earthquakes at any place on earth, using small nuclear devices. However, we had no idea they can create earthquakes using "Environmental Modification Techniques"! Such capability means that scientists afar off, pulling certain levers, can create earthquakes wherever they want, and probably, of the intensity they desire. It is one thing for people to live in such earthquake prone areas like California, thinking they will just "take their chances" of an earthquake killing them. But, it is another matter, indeed, for people living in these earthquake prone areas to understand they are in a hunter's rifle scope!! Of course, the "rifle" being aimed at them is not a traditional rifle, but the weapon of Weather Control that can produce earthquakes wherever and whenever they choose, of whatever intensity they choose. These Weather Control techniques can damage, injure, or destroy, the "biota" of a nation! The word, "biota" refers to the "animal and plant life of a particular region considered as a total ecological entity". [Dictionary] In other words, these Weather Control capabilities can wipe out an entire ecological system?! This revelation is astounding! If the goal of the scientists wielding these weather weapons, is to totally annihilate a civilization, they can easily do so, it appears! What complete ecological system in these United States might be at risk? At this point, I do not know, but we are certainly researching this question vigorously. These Weather Control techniques can damage, injure, or destroy the "lithosphere" of a nation. The word, "lithosphere" refers to "the solid outer layer of the earth. It lies above the semi-fluid asthenosphere [30-150 miles down] and includes the crust and the solid part of the mantle down to about 75 kilometers (47 miles)." [Dictionary] My friends, this is precisely the region that are affected by earthquakes! We should now be under no illusion that our scientists, and our Government, can produce any earthquake they want to, in whatever area they want to, and at whatever intensity they desire! Are you in their direct line of fire? Are you living in an area they are planning to obliterate any time soon? These Weather Control capabilities can also damage, injure, or destroy the atmosphere of a nation, or group of nations. We will soon report the conclusions of a book entitled, "Angels Don't Play This HAARP", written by a concerned New Age scientist who worked on this Government program for a while before he became totally concerned about the possibility of totally destroying the Earth's atmosphere. This will be a series of very interesting articles. Stay tuned. Outer Space can even be damaged, injured, or destroyed by these weapons. We are at this point now. Vice President Gore is the lead man in creating the oratory that will turn "humanity upside down" in order to usher us into the kingdom of the New World Order. Rush Limbaugh is the lead man in ensuring that no one will ever understand how thoroughly they have been "stage-managed"! To create the devastating disasters that will convince the majority of the people that they must relocate, abandon our Industrial Civilization, and accept the draconian "remedies" espoused by Antichrist. Watch President Clinton in this regard. The Guiding Spirits of Ruth Montgomery revealed, in her book, "Herald of the New Age", that the President of the U.S. during the decade of the 1990's, would begin to urge people to take note of Environmental issues, and to begin to prepare us for the need to relocate. President Clinton has taken up this Environmental role. Watch Clinton address Environmental issues as these planned disasters begin to unfold, and watch him specifically begin to talk about "relocating" into "safe areas" of the country. We should now understand that our past 5 years of "unprecedented" violent weather is the result of these Weather Control capabilities. We find it very, very sobering to realize that the control of our Weather, and the ability to wreak havoc and devastation on an entire nation, continent, and ecosystem, is now in the hands of Luciferians. These people have deliberately written much about their desire to control the earth, to destroy our current civilization, and to rapidly reduce population by 4 billion people.